At Mantra, we are delighted to be working with Breast Cancer Haven on a new collaboration in our ‘Mantra Changes Lives’ collection. This is our initiative to raise funds, show support, and build awareness for important causes. Breast Cancer Haven is a national charity that supports women through their breast cancer treatment, providing a tailored package of emotional, physical and practical support. With six welcoming centres across the UK and an expanding network of other services, the charity is there to provide women with the support that treatment alone can't. The new Mantra disc necklace features a heart with a pink cubic zirconia stone set beneath, with the charity’s signature ribbon swirl incorporated into the heart design. The piece represents the inspirational mantra, ‘You’re someone special. Someone strong. Someone loved’. For someone who is going through breast cancer, or who has experienced it in any way - this mantra acts as a powerful reminder of the love that surrounds them, and the strength they have as an individual. For someone who has supported a loved one as they go through treatment, this sends a message of love and gratitude. The mantra comes directly from a core objective of Breast Cancer Haven: to focus on the individual person going through breast cancer. As the charity explains, when breast cancer comes along, you can find yourself being relegated to the status of a patient, a passive observer in your own treatment. It doesn't have to be that way. Breast Cancer Haven see you as a person, not a patient. The necklace is priced at £50 in Sterling Silver and £70 in Yellow and Rose Gold-plated, with 25% of the retail price going to Breast Cancer Haven. It launched on March 1st. It is blank on the reverse to allow for personalisation, with a name, date or special word or phrase. 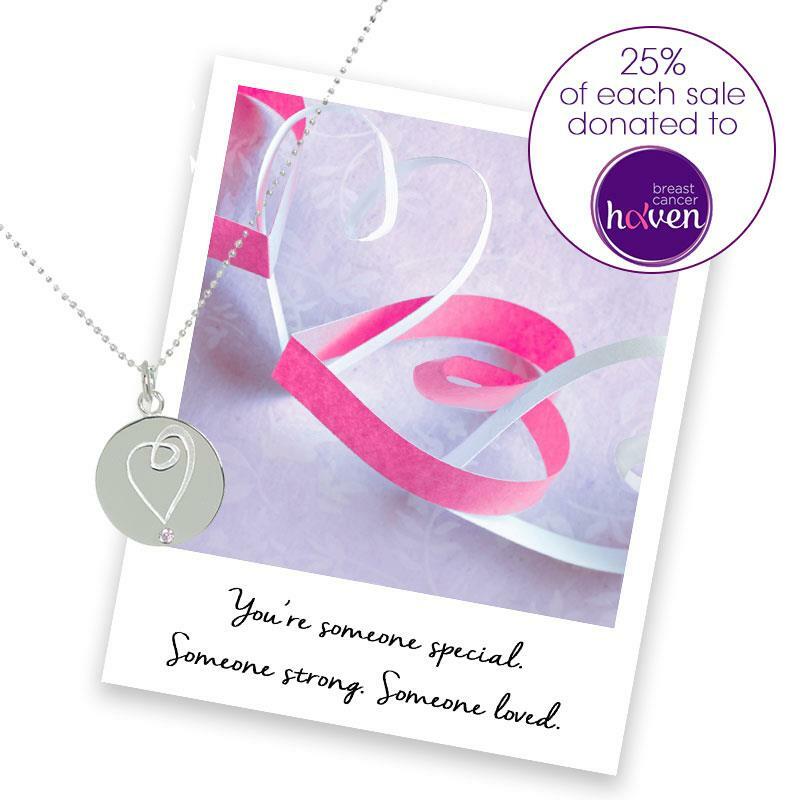 A supportive gift for someone going through breast cancer, or a thank you to someone who has helped and supported that person, the necklace is also a powerful reminder to any friend or family member of how special and loved they are. 25% of the selling price going to Breast Cancer Haven. To find out more about Breast Cancer Haven (Registered Charity No.1061726), visit at www.breastcancerhaven.org.uk.